An abundance of rivers, streams, lakes and ponds enhance Missouri’s landscape and provide anglers with a chance at some premier fishing opportunities throughout the year. We’ve given you three of the best bets to up your odds of catching fish during each month of the year across Missouri. High oxygen levels and clear waters make Taneycomo an incredible trout fishery, and winter can mark some of the best fishing of the year. Trout numbers are maintained by Missouri Department of Conservation (MDC) stocking efforts. Around 600,000 rainbows and 10,000 brown trout are stocked annually. 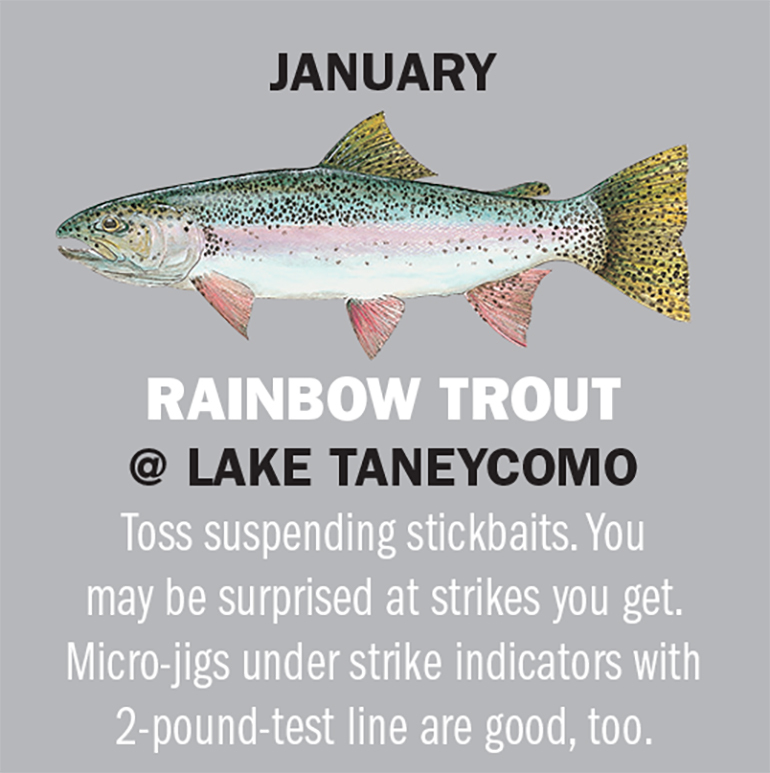 About 90 percent of fish at Taneycomo are rainbows and about 7 percent are browns. Anglers should know that this impoundment’s water levels vary greatly and boating can be hazardous or limited to drift fishing in the upper end depending on water generation. Hit the stretch from Table Rock Dam to Fall Creek for trophy trout. Fishing is limited to artificial baits here, and trout are protected by a 12- to 20-inch slot limit, which means fish in that size range must be released immediately. Other Options: Table Rock Lake Bass: Try spoons or blade baits for smallmouths or spots suspended in 40 to 150 feet of water. Council Bluff Lake Bluegills: Fish on or just above bottom with mealworms, crickets or worms in January. The deep, clear waters of Bull Shoals offer anglers a great chance at a limit of spotted bass. Expect to find good numbers of spots 12 inches or better. It’s rare to catch a spotted bass over 15 inches, though. There is a chance to hook a real lunker, however. An angler landed a spotted bass from the Arkansas portion of the lake that weighed in at 7 pounds, 15 ounces; it’s the current Arkansas state record. Anglers are encouraged to keep spots over 12 inches. Good bass numbers exist due to 2013’s good spawn. The spot’s diet consists mainly of crawdads, so about any artificial that resembles crayfish is probably your best bet for catching a limit of spots. Other Options: Thomas Hill Reservoir Crappies: Fish for slabs at the warmwater discharge. Stockton Lake Walleyes: Fishing picks up as the fish move into the lake arms to spawn. 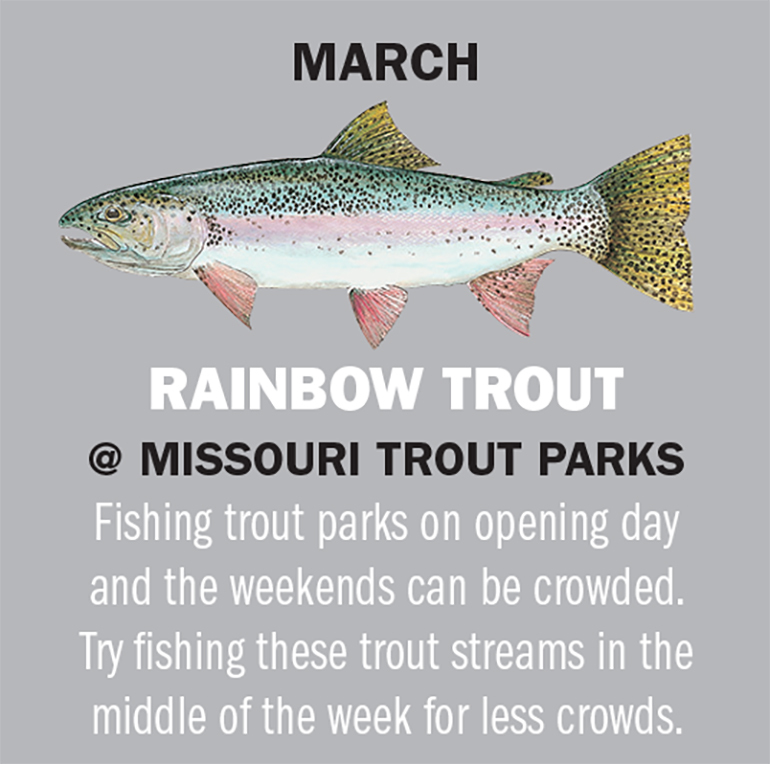 March 1st is the celebrated, much-anticipated, time-honored tradition of opening day for “catch and keep” trout fishing at Missouri’s trout parks — Montauk State Park near Salem, Bennett Springs State Park near Lebanon, Maramec Springs Trout Park near St. James and Roaring River State Park near Cassville. Last year, 4,666 adult and youth daily trout tags were sold at three of the trout parks on March 1st. That’s a lot of anglers, but there are many more trout stocked than there are anglers for the annual opener. At Bennett Springs alone more than 7,000 trout were stocked. Most are 2 to 5 pounds, but some might weigh up to 8 pounds. Anglers must have a daily trout tag and trout permit besides the statewide fishing license at the parks. Know each park’s regulations before fishing. 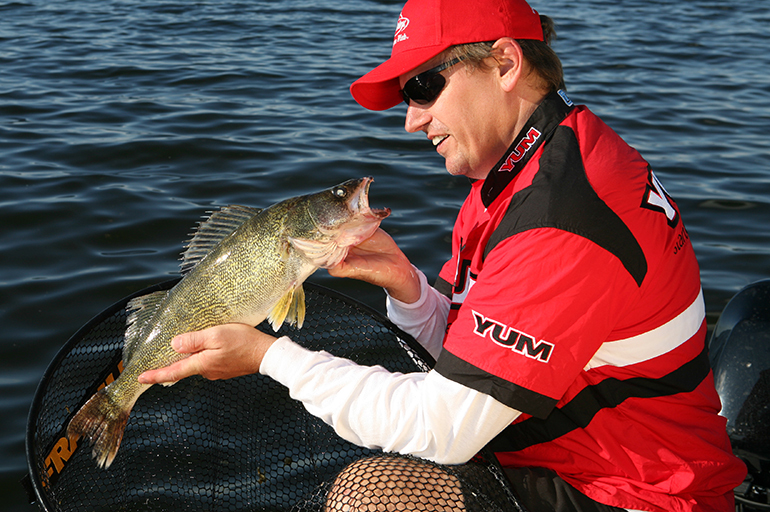 Some stretches allow artificial baits only, and length limits may apply. Other Options: Truman and Lake of the Ozarks Paddlefish: Paddlefish snagging can be good now. Check MDC fishing reports for conditions and fish whereabouts. Stockton Lake Walleyes: Try fishing in the upper arms as walleyes begin the spawn. When talking springtime crappie fishing, Pomme de Terre Lake wouldn’t be your first thought as a place to go. The manmade lake is best known for its muskie fishing but secretly might be one of the state’s best crappie lakes. High water in the spring and summer of 2015 provided excellent conditions for an outstanding crappie spawn. Huge numbers of crappie were added to the population at Pomme, and fishing for both black and white crappies should remain outstanding for a few more years. Anglers can expect good numbers of crappies exceeding the 9-inch minimum length limit. Fishing is good here year ’round but great in the springtime when the fish are up against the banks spawning. You might be surprised at how close to shore some crappies make their nests. Other Options: Bull Shoals Lake White Bass: Fishing on the Beaver Creek Arm is hot as fish are in spawning mode. Busch Wildlife Area Largemouth Bass: Farm ponds or small public lakes like those at Busch offer good early season largemouth bass fishing. Over the years, Bull Shoals has somehow gotten lost in the shuffle as a great bass fishery. Missouri’s state-record largemouth bass comes from this impoundment. Marvin Bushong caught the 13-pound, 14-ounce mammoth-sized largemouth on pole and line back on April 21, 1961. Traditional largemouth bass waters here are known to begin around Beaver Creek. The Beaver Creek Access is located in Taney County. Other good accesses in that county include River Run and K-Dock. From the middle of the lake down to the dam is where the lunkers are found. Anglers can expect a lot of fish 15 inches and larger here. Other Options: Mississippi River Walleyes and Saugers: Fishing on the Mississippi River in northeast Missouri can be hot. 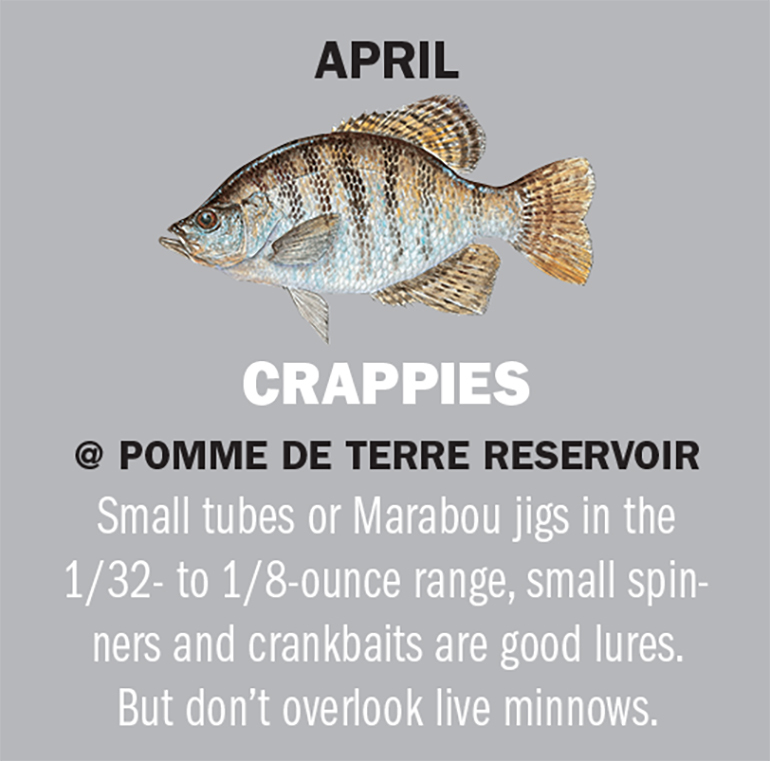 Mark Twain Lake Crappies: Minnows and jigs work near the banks early and out a bit deeper later in the month. I have a special fondness for this Ozark river, partly due to my many fishing trips there in my younger years. Anglers have good shots at loads of small bass anywhere on this scenic river, but if you’re after big bronzebacks, fish the stretch of river downstream from Slabtown Access in Texas County to where Big Piney joins the Gasconade River in Pulaski County. This stretch is a Smallmouth Special Management Area. Expect to catch many fish in the 12- to 15-inch range, with some as large as 20 inches! Only one smallmouth may be kept, with a minimum length limit of 15 inches. Anglers are encouraged to catch and release smallies in all waters to maintain good fish populations. Other Options: Truman Lake Gills: Bluegill fishing can remain hot and heavy as fish continue to spawn in the coves. Lake of the Ozarks Largemouths: June fishing is tops. Look for fish in flats and moving back into the lake arms. The only thing better than catching goggle-eye is eating them. They are an often overlooked panfish found in Ozark streams. Also known as rock bass, they get longer and thicker than most panfish, making them more fun to catch and better table fare. They are easily recognized by their mottled body patterns and large red eyes. The upper portion of the Gasconade has good numbers of fish. MDC surveys show that 13 percent of the rock bass there are at least 8 inches or longer, and 2 percent are over 9 inches. The middle section of the Gasconade is also a great goggle-eye fishery but probably receives more fishing pressure because waters are more navigable with a boat. Even the lower reaches of the river provide good goggle-eye fishing, but wade-fishing opportunities are few and far between in this stretch. Other Options: Truman Lake Crappies: Try fishing for crappies around the lake’s brushpiles. Mississippi River Flatheads: Catfishing on the Mississippi River heats up during July. If you don’t live near Kansas City, you’ve probably never heard of Lake Jacomo. This 970-acre lake is in Jackson County’s Fleming Park and is home to Missouri’s state-record pole-and-line channel catfish. Gerald Siebenmorgen caught the record cat on Oct. 12, 1976. His trophy catch weighed in at a whopping 34 pounds, 10 ounces. There are abundant channel catfish at Lake Jacomo. Anglers can expect many fish over 15 inches long, but there are good numbers in the 10- to 15-pound range, too. Fish are routinely stocked to maintain numbers for anglers. According to the MDC, channel catfish congregate in backs of coves where feeder streams empty into the lake, especially after a good rain. Waters near the south marina and the area between the north marina and the dam are excellent catfishing waters. (Note: Boat motors are limited to 25 horsepower, and pontoon boats are limited to 40 horsepower). Other Options: Meramec River Largemouths: Find bass in the backwaters and deep pools this time of year. Fellows Lake Muskies: A good bet is casting big baits at big muskies on this 860-acre lake. September is just about the best time to do battle with one of the hardest fighting predatory fish in Missouri: the mighty musky. These toothy fish can grow to extra-big sizes that require big baits and big tackle to handle them. The muskie state record in Missouri is 41 pounds, 2 ounces. Henry Sever Lake in northeast Missouri is one of this state’s best but often overlooked muskie-fishing waters. Perhaps it gets overlooked because it’s rather small at just 160 acres, but that can keep the big crowds away too. Although a smaller body of water when compared to the larger impoundments across the state, Henry Sever Lake is home to some really big muskies. About three out of every 10 muskies at this lake will exceed 36 inches in length! This lake has a concrete boat ramp, two fishing jetties and a disabled-accessible fishing dock. Other Options: Current River Brown Trout: Fish for browns in the upper portion below Montauk State Park. Big River Smallies: Smallmouth fishing on this river south of St. Louis starts ramping back up. I’ve heard it many times, people talking about not wanting to fish Lake of the Ozarks because of too much water traffic. By the time October arrives, most vacationers have gone home, and the water is left for bass fishermen. Often called the granddaddy of all of Missouri’s big lakes, this body of water consistently produces good populations of largemouth bass, and October is a great month to catch them as they start moving back into shallow waters to gorge before winter. The MDC conducted electrofishing surveys in 2017 at different areas on the lake and found the largemouth bass population there thriving. Surveys showed that 25 percent of the bass on the Niangua arm of the lake were equal to or greater than the 15-inch minimum length limit. On the Glaize arm, 21 percent of the bass were in that size category. Other Options: Lake Taneycomo Brown Trout: Big browns are on the radar of trophy trout anglers in October. Gasconade River Smallmouths: Float and fish this river now for some great smallmouth bass fishing. The deep, clear waters of Table Rock Lake are home to some good walleye fishing. By the time fall rolls around, these loosely schooling fish are in a different pattern than much of the rest of the year and can be hard to find; that’s why many anglers troll for them. Walleye fishing at Table Rock has improved quite a bit in recent years. The MDC has stocked surplus walleyes into the James River arm in 2013, 2014 and 2016. Their fish sampling in 2017 shows that their stocking efforts in the James River arm proved fruitful, with many quality fish in the 18- to 23-inch range found in the survey. And 58 percent of the walleyes sampled were greater than or equal to at least 20 inches! Fish sampling in the Kings River arm of the lake showed roughly similar results. Other Options: Mozingo Lake Largemouths: The bite is hot and heavy for largemouth bass right now on Mozingo. Mississippi River Saugers: Sauger fishing on the Mississippi River north of St. Louis is a good bet now. Don’t put away your fishing gear just yet because the crappie fishing at Truman can be hot in December. Anglers can expect excellent numbers of crappies in the 9-inch range, with some exceeding 10 inches in length. Those are some good-sized slabs. Crappies will gather in large schools in the winter months, and once you find them, you can be in for some excellent fishing. Try fishing woody cover along steep bluffs and points. In the middle stretches of the lake, fish standing timber and brushpiles near creek channels. Try fishing all around the cover. If fish aren’t on one side of the brush, then cast to the other side. Several unusually warm days can move crappie into reasonably shallow water. Don’t be afraid to fish the banks in five feet of water or so during a warm stretch. 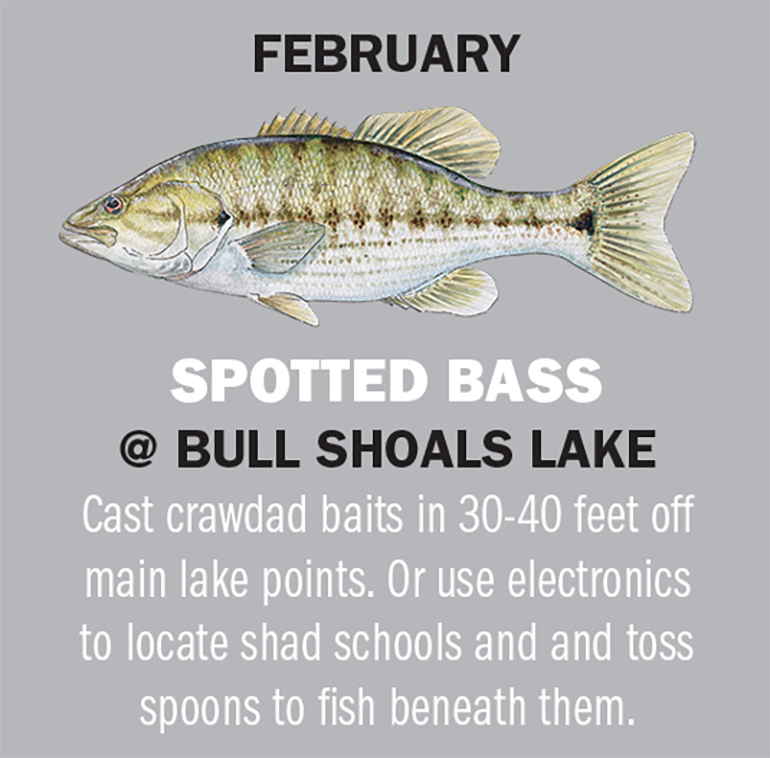 Other Options: Table Rock Lake Spotted Bass: The fishing for spotted bass can be good in the winter months. Small-Lake and Farm-Pond Gills: Don’t overlook bluegill fishing in any farm pond or small public lake right now.